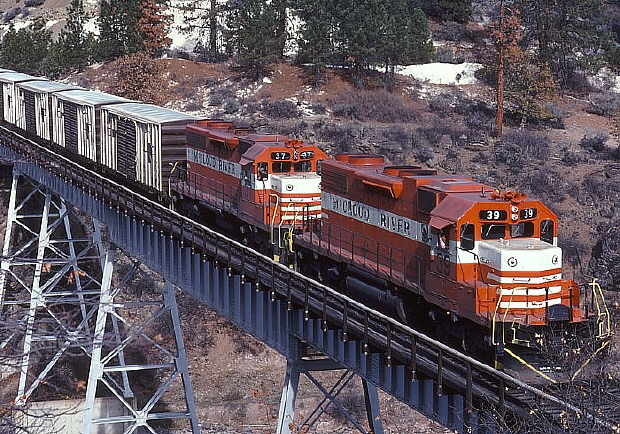 McCloud River Railroad; History: 1977-1992. This photo was taken by an Itel promotional photographer shortly after they purchased the road. This photo was on display in the company headquarters for many years, but was salvaged by Travis Berryman shortly before the depot burned down. Travis presented this photo to George Landrock. Photograph is courtesy of George Landrock. The middle 1970's were marked by a supposed shortage of boxcars in the railroad industry. When one railroad uses a railcar belonging to another to transport freight the user road pays a per diem charge to the owning road for the use of the car. The McCloud River had always relied upon cars belonging to other roads to move freight in. Owning a fleet of cars would provide some revenue in the form of per diem paid to the owning road while the cars are elsewhere, but more often than not the per diem rates were to low to make car ownership feasible for small companies, especially during times of plentiful car availability. The railroad had investigated the possibility of purchasing its own interchange freight cars in the past, but the anticipated return on investment did not make purchasing such cars worthwhile. Several sectors of the railroad industry took advantage of the supposed boxcar shortage by getting the regulatory agencies to agree to the "incentive per-diem" concept that would reward those who invested in new, modern boxcars with substantially higher per-diem rates than what would be normal for comparable equipment. 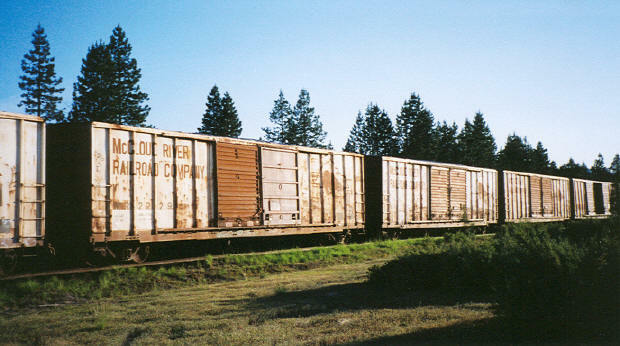 Many shortline companies like the McCloud River saw gold in the artificially inflated per diem rates, but very few of them had the readily available capital to purchase fleets of new boxcars outright. A small group of leasing companies appeared on the scene to provide boxcars to the shortlines. Before long dozens of shortlines that had never owned a single interchange freight car in their histories had their names on sometimes thousands of new boxcars in service across the country. Itel was one of those leasing companies. The company was founded in 1972 under the name Environmental Leasystems Corporation. Itel specialized in owning cars which it leased to third parties (at its height Itel owned about 70,000 railcars), rolling stock repair facilities, and ownership of shortline railroads. Itels first railroad was the Hartford & Slocomb Railroad, a 22-mile long railroad in Alabama purchased in 1975. Itels next road purchased was the McCloud River Railroad, acquired in 1977. In December of 1997 Itel purchased the Green Bay & Western Railroad, a regional paper hauling road located primarily in northern Wisconsin. The Ahnapee & Western was added in one of the two 1977 transactions. The Ferdinand & Huntingburg Railroad of Indiana was purchased in 1983, and the company expanded again in 1988 with the purchase of the Southern Railroad of British Columbia and the creation of the Fox River Valley Railroad. All of the railroads purchased by Itel were previously existing companies except for the Fox River Valley, which was created to operate a group of branchlines purchased from the Chicago Northwestern. Itel purchased the McCloud River primarily because it was a major source of boxcar traffic and because it had a large shop capable of making repairs. Champion-International was receptive to an Itel offer, and the transaction was finalized in 1977. The new ownership had little effect on the day-to-day operations of the road. One of Itels first moves was to provide the McCloud River with its own boxcars. A total of four hundred new boxcars were purchased in mid-1977 for the road. The cars were built by FMC Corporation in Portland, OR. The cars were white with brown ends, doors and lettering. These cars were used to move some freight on the railroad, but were primarily used produce per diem revenue while in operation on other railroads. The McCloud shops became the home maintenance base for the cars, and through time additional boxcar fleets leased to other western shortlines by Itel were assigned to the McCloud shops for maintenance. A line of boxcars in the McCloud's storage yard just east of McCloud. June 2004. Unfortunately for Itel, the late 1970s and early 1980s were very rough times economically for the timber industry. The same six sawmills that had kept the railroad healthy since 1964 were still in place, although some were under new ownership. The McCloud mill was still owned and operated by Champion-International; the Scott Lumber Company mill in Burney was sold to Publishers Forest Products Company in 1969; Cheney-Grant continued with few changes; and the Lorenz Lumber Company mill was sold to Farley and Loescher in 1962, who in turn sold the mill to Fibreboard Corp. in 1965. Fibreboard was purchased in turn by Louisiana Pacific in 1978. The railroad was severely hit by mill closures beginning almost as soon as Itel took over. The first mill to go was Publishers in Burney, closed in 1978. Cheney-Grant in Pondosa closed shortly afterwards, and the mill in Mt. Shasta City went under a short time later. The real shock came in 1979 when Champion-International decided to end all operations in McCloud. The end result was that by the dawn of the 1980s the only shipper left on the road was the Louisiana Pacific mill. P&M Cedar Products purchased and re-opened a portion of the McCloud mill, but they did not use the railroads services much. The railroad continued to earn revenue performing maintenance on Itel boxcars and by leasing surplused locomotives out to other railroads, but freight operations dwindled to almost nothing and were often run for the sole purpose of moving empty boxcars on and off the railroad. The 34 miles of track between Hambone and Lookout Junction were still owned by the Burlington Northern Railroad (successor road to the Great Northern), and the steep decline in traffic nearly dried up operations of any type on this line. Burlington Northern responded by starting abandonment proceedings on the line. 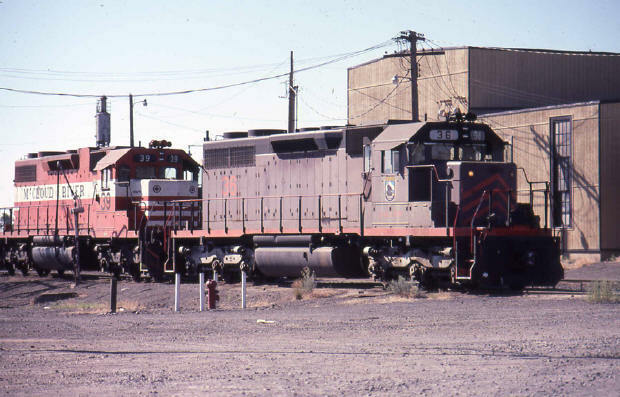 An example of McCloud leased locomotives to other railroads...the #36 and #39 are seen here at the Burlington Northern's Klamath Falls, Oregon, locomotive facility. Photo by and courtesy of Jerry Lamper. The situation on the railroad improved in the very early 1980s when California lumber giant Sierra Pacific Industries purchased and re-opened the old Publishers mill. The railroad suddenly found itself with a major shipper again, and freight operations rebounded. Typical operations during this time period saw two trips a week to Burney and two corresponding trips a week to Mt. Shasta City to keep the flow of empties to and loads from the two mills in Burney, while operations on the Lookout line saw about one train every three weeks. The railroad was able to successfully land a major grant from the Federal Railroad Administration in 1982 that allowed for a complete rehabilitation of the track structure and roadbed. The recession of the early 1980's had a slowdown effect on traffic from al sources, and that plus the thousands of new boxcars built in the late 1970's created a severe boxcar surplus. The incentive per diem concept was also found to be illegal at this time. The smaller railroads were hit the hardest by this change of events as they suddenly had to find room to store the long lines of boxcars no longer needed on the nation's rail system. Many railroads simply turned their boxcars back to their lessor. The McCloud River had lots of siding storage space available, and Itel routed many cars to the McCloud to be stored. A good many of these were entered onto the McCloud River roster and were given McCloud River reporting marks and numbers. By the mid-1980's it was possible to see boxcars painted for the Arcata & Mad River, Sierra Railroad, City of Prineville, Seattle & North Coast, Ahnapee & Western, Camino Placerville & Lake Tahoe, and other railroads in storage on the McCloud River. The passenger equipment saw very little use after 1975. The road did run a small handful of passenger excursions, but only for school or civic groups. No excursions were run for the general public, and by the early 1980s all passenger equipment was off the railroad. The last steam locomotive, #25, was still on the roster and in storage. Itel was aware that it owned a steam locomotive, but it was not entirely happy with the fact. Itel ordered the McCloud River to get rid of the #25 as soon as possible. The new president of the road, Bill Herndon, eventually obtained permission from Itel to place the locomotive on public display instead of scrapping or selling the machine. In 1981 the Great Western Railroad Museum approached the McCloud River asking about the possibility that they be allowed to lease and operate the locomotive. The railroad was willing, and the museum was given an operating lease on the locomotive along with some shop space to perform restoration work. The museum restored the locomotive to operation through the winter of 1981/1982, and the locomotive operated again on 8 May 1982, pulling two excursions between McCloud and Mt. Shasta City on that date. The excursions were run primarily as a fundraiser for the Mt. Shasta High School class of 1982. Several leased gondolas and the railroads VIP caboose provided the passenger equipment, and one of the diesels tagged along just in case. The Great Western Railroad Museum liked what it saw in McCloud and decided to make an attempt to locate its museum and collection in McCloud. The museum was able to successfully obtain the old Champion International truck shop that was located adjacent to the railroad on the eastern edge of McCloud, and parts of the museums collection were moved to McCloud. The #25 continued to operate sporadically from 1982 through 1986, with an average of one to three trips run per year. Hollywood once again called on McCloud in 1986 when it used the McCloud to film parts of the movie Stand By Me. Several scenes were shot on and around the railroad, with the highlight being one sequence that featured the four main characters of the movie being chased across the Lake Britton Bridge by a train. The train consisted of the #25, a fire service tank car, a flat car, the railroads Burro crane, a side-dump ballast hopper, and a caboose. The filming of the movie proved to be one of the last runs of the #25 in its third career, as later that year or early the next the title for the #25 passed from the railroad to the museum as a result of a breach of contract issue. A newspaper advertisement that the railroad ran in the local papers in the 1970's, from the collection of George Landrock. Early 1986 saw a wave of powerful storms batter northern California, wreaking havoc one road and railroad operations across the entire area. The McCloud was affected by the storms, suffering two major washouts and numerous smaller washouts between Bartle and Pondosa. The line to Burney was closed from mid-February to mid-March while the storm damage was repaired. The Burney area contained vast deposits of diatomaceous earth, a white chalky substance composed entirely of skeletons of miniscule sea creatures. Diatomaceous earth was used primarily in swimming pool filters, but has many other uses including abrasives in toothpaste. The substance had been mined off and on since the 1920s. One operator had shipped carloads of the stuff out over the power corporation railroad in the 1930s, and another operator had briefly established a reload on the railroad in the Arkrite Flat area. Dicalite, a major miner and processor of diatomaceous earth, was conducting operations off the northern shore of Lake Britton and had expressed interest in shipping by rail for many years. The roadbed of the old power corporation railroad from Cayton area to the Pit 3 dam and powerhouse was (except for a couple collapsed trestles) still basically intact, and it came very close to the Dicalite processing plant. A new line to the plant was surveyed, but nesting Bald Eagles prohibited any construction from taking place. Negotiations continued to take place, resulting in a special excursion operated on 22 September 1986. The excursion consisted of two diesels, three leased passenger coaches, and the VIP caboose. The special train took two busloads of railroad and Dicalite officials from Cayton siding north to McCloud. The efforts proved to be successful, as within a short time a reload was built at the Cayton siding and diatomaceous earth soon started flowing outbound in boxcars and covered hoppers, giving the railroad a stable shipper not related to the timber industry. Bill Herndon was promoted to a position in Itel headquarters in San Francisco in 1988, and Jeff Forbis was appointed as the railroads new president. Mr. Forbis immediately started searching for ways to increase revenue on the railroad. Two diesel locomotives were purchased to test the rebuilding capabilities of the McCloud shops, and additional railcar repair jobs were taken in. Every opportunity to increase freight on the line was investigated. The Burlington Northern continued to keep the Hambone-Lookout line on the list of lines subject to abandonment in the near future, but the best revenue producing idea created by the new management came along to save it. Several large printing companies were located in the area immediately north of Reno, NV, and they consumed huge quantities of paper manufactured in the upper Midwest and transported by rail to the area. The transportation involved several different railroads, and delivery to Reno was often slow and questionable. Most of the paper originated on or near the Burlington Northern, but Nubieber was as close to Reno as that railroad got. However, McCloud and Reno were closely linked by highways, and McCloud had a vacant warehouse facility that formerly housed a lumber reload center. A new customer, Sprint Reload, was soon established in the old reload center. Before long many boxcars loaded with paper a week were showing up at Lookout Junction to be taken to Sprint Reload, where the paper was warehoused until needed in Reno. Sprint Trucking, an affiliated company, made the final delivery from McCloud to Reno. By mid-1990 the railroad was moving two full trains a week to and from Lookout Junction, and BN backed off of its abandonment attempts. Maintenance costs on this line were evenly split between the two railroads, and for many years the BN had provided little to no money for track maintenance. With the line seeing heavy use again, track maintenance once again became a priority. The late 1980s also saw the removal of most of the old Pondosa branch. The branch had produced no revenue since the closure of the sawmill in the late 1970s, and the railroad was required to continue to maintain three grade crossings located on the line. The rails were picked up except for the first two or so miles of the branch, which were left in place for continued boxcar storage. Another blow to outbound traffic was received about 1990 when the old Lorenz sawmill shut down. Louisiana Pacific sold off its Fibreboard subsidiary in mid-1988, and until the closure the mill operated under the former name. However, the closure did not have an immediate effect on the Burney community as a new sawmill was being constructed by Burney Forest Products west of the Sierra Pacific plant, and most of the laid-off workers found employment at the new sawmill. The primary feature of the new complex was a co-generation plant, but the owners had to add the sawmill on to gain enough political support to get the needed permits. Burney Forest Products expressed desire in being served directly by the railroad, and surveys were run for a new rail line that would have branched off of the Sierra branch above the Sierra Pacific mill and run into the new complex. However, the railroad could not come to terms with the landowners that it would need to cross to reach to new mill and efforts to find another suitable reload site in the Burney area failed, and Burney Forest Products settled for trucking all of its lumber to market or to reloads on other railroads in the area. The railroad would receive another major blow before the end of 1990. A few days before Christmas the railroads two story log-cabin style passenger station and office complex in McCloud, built in 1929, burned to the ground, destroying many of the companys records as well as many historic artifacts and pictures housed in the building. The railroad leased the nearby building that formerly housed the offices of the McCloud River Lumber Company and Champion-International for a few years until a corner of the shop building was expanded and remodeled to accommodate the offices of the company. The railroad entered the 1990s in reasonably good health. Additional revenues were created when the railroad was able to convince a co-generation plant in Burney to start receiving hog fuel (woodchips) by rail, and before long the inbound paper traffic coming through Lookout Junction was complemented by inbound loads of woodchips. At the same time the railroad was having difficulty getting empty cars from the Southern Pacific, and about 95% of the railroads traffic (both inbound and outbound) was moving through Lookout Junction. The railroad often did not need all four diesels on the roster and continued to make money by sporadically leasing spare units out to other railroads.